« Finally some VeloMap News again …. Therefore I also update the Europe map again, because on large area maps, this is even more important. However not only is it faster now on the desktop – but also on the GPS the basemap will become visible earlier, making zooming out work much faster (before I always had to compromise between speed on GPS, vs speed on Desktop, not anymore). Therefore however again I had to add some types to the .typ-file (0x11f04, 0x11f05, 0x10f0a). Besides the work on the overview map, I will start to work on a worldwide basemap. The problem is that currently some Garmin GPS come with a routeable basemap, in some cases this destructs the routing of detailed maps, like openmtbmaps and velomaps. I will try to create a good basemap, that can go in combination with velomaps/openmtbmap showing the most important map features there are (rivers, lakes, sea, huge cities, borders, motorways, maybe some major railways…). Besten Dank! Nun ist alles klar. Ich finde erstmals diese Pfeilsymbole und weisss nicht, was diese bedeuten. Kann mich jemand informieren? 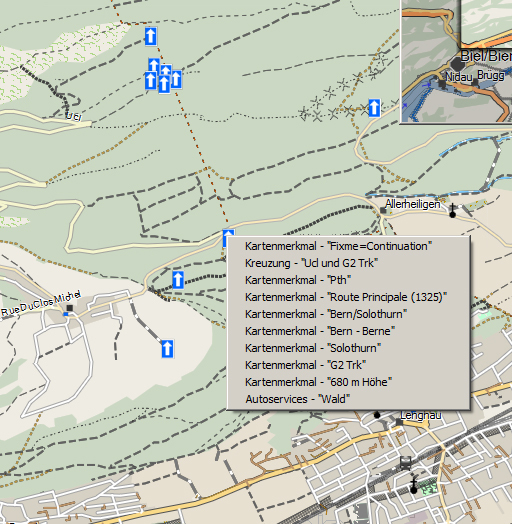 Das bedeutet dass da jemand in OSM getagged hat – dass da ein Weg weitergeht und in OSM noch fehlt. (continue=yes etwa).